The Secret Santa Foundation, Inc., is based in Charleston, WV. It was founded to ensure that children didn’t go without toys on Christmas morning, and so that no parent would suffer the guilt of not being able to provide those toys. Every year since 1984, this program has fulfilled this promise to boys and girls in Kanawha, Boone, and Putnam Counties. Over the years, the program has grown by leaps and bounds. Once operated out of our founders’ basement, the program has expanded to serve the needs of approximately 1400 local children each year. The Secret Santa Foundation primarily serves children ages newborn to twelve. Throughout the years, the Secret Santa Foundation has had tremendous support from businesses, civic groups, local media, and individuals. This great show of concern has allowed the Foundation to grow and to help make Christmas a reality for many children who would otherwise go without on Christmas. In the fall of each year, applications are sent out to families. Once completed, the applications are screened for eligibility by the Christmas Bureau and distributed to various service agencies such as Secret Santa Foundation. Secret Santa Foundation is a very unique program in that it provides toys the child actually requests. Each child completes a “wish list” of three toys and returns it to Secret Santa. The child is matched with a sponsor, or “Secret Santa,” who is responsible for purchasing the toys on the list. Each gift is approximately $25.00. The sponsor is given the child’s first name, an identification number, and the child’s wish list. The gifts are labeled and bagged before they are delivered to a drop off site by the sponsor. 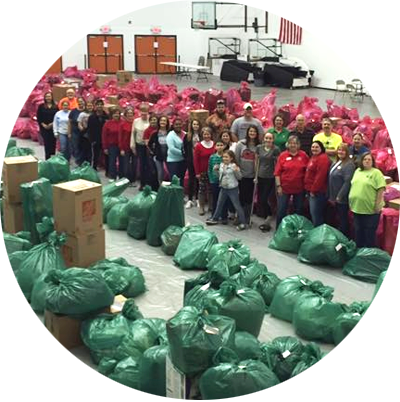 During the first week of December, the gifts are then gathered and brought to one central distribution point where they are sorted, counted, and bundled for the parents to pick up before Christmas. The Secret Santa Foundation has now become a year-round program as we join other non-profit organizations in an effort to better serve our community. Countless hours are spent each year planning and running the program. However, none of our officers receive any salary or compensation for their efforts. The foundation is always looking for volunteers to help ensure our success, financial contributions to fund operating costs as the program continues to grow, and of course, Secret Santas are needed during the Christmas season.